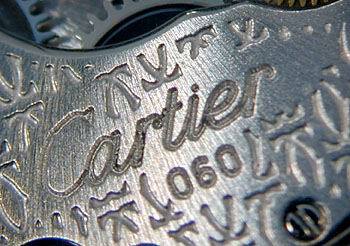 Cartier 一直是以「設計」為出發點，而不是以「機芯」；畢竟它是珠寶商，其強項是珠寶設計。雖然是珠寶商，一百多年來，其多項腕錶經典作品，也已經於錶界佔有很重要之地。Cartier 在珠寶界的地位，溫沙公爵曾說：... "Joaillier des Rois, Roi des Joailliers" (Jeweller to Kings, King of Jewellers") - Prince of Walse. 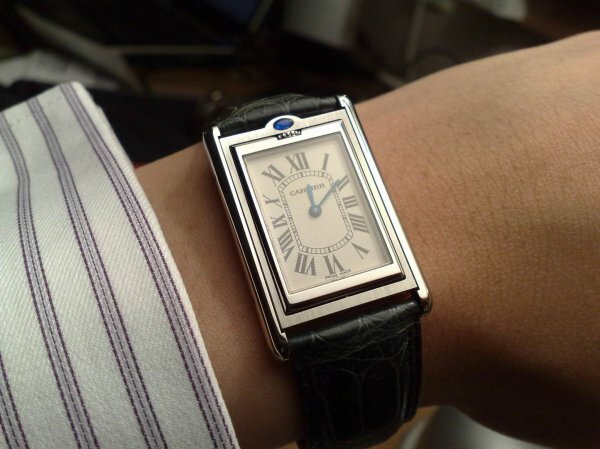 Steel Rectangular Reverso style case with & front sapphire glass. Silvered guillochei dial with black Roman Nos. & blued steel hands. 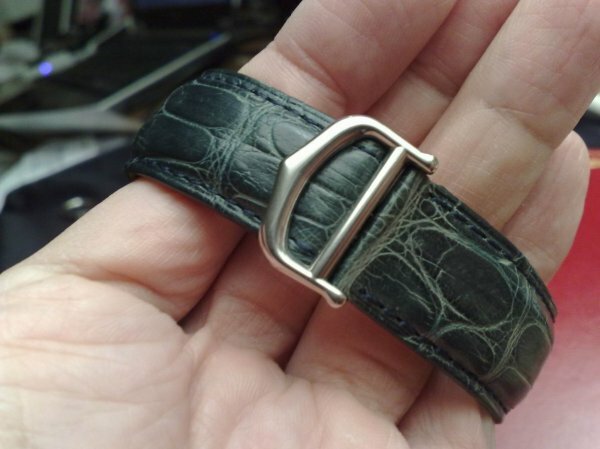 Fitted with Croco Leather Strap & deployment buckle. Easily slip into your cuff! 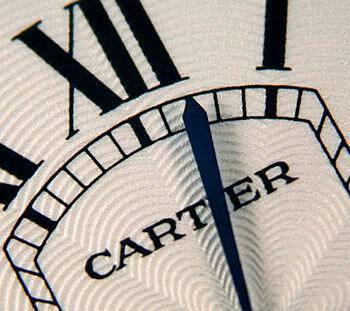 Cartier is not a company that leaps immediately to mind for technical achievement in the field of horology. 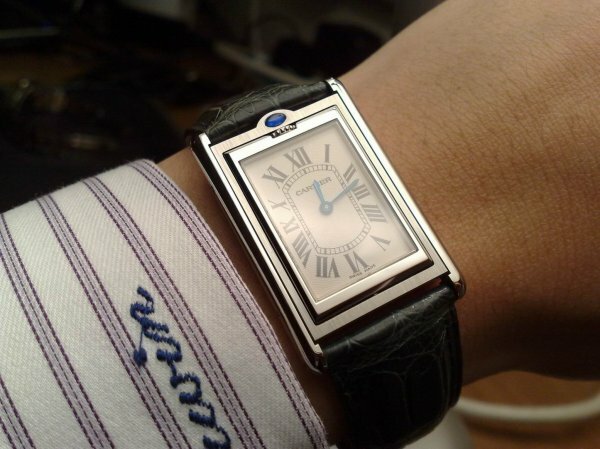 Louis Cartier, heir to the family jewelry firm founded in 1846, was, however, a design pioneer in luxury goods, including the wristwatch. 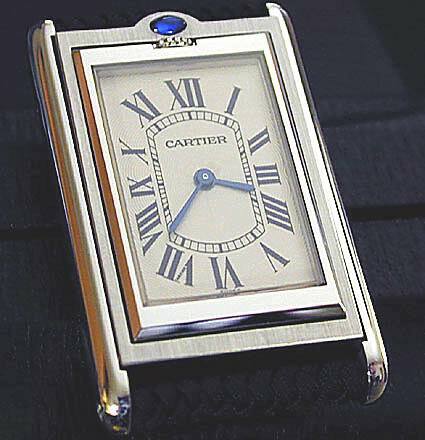 Although never a movement manufacturer, Cartier has made a very significant contribution to horology by virtue of the sheer prowess of the company's design work. 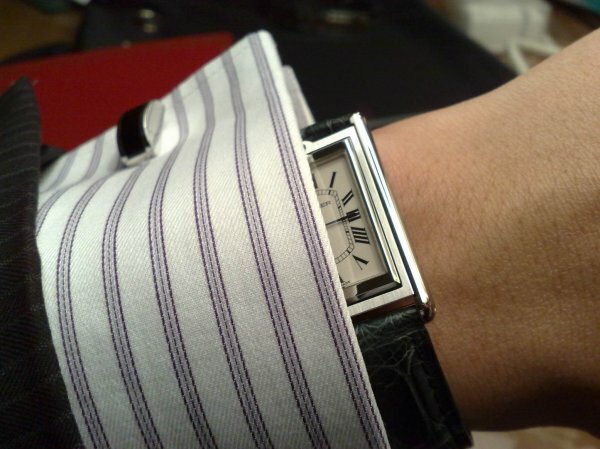 Historically, it was Cartier and Rolex who defined the physical form of the 20th century wristwatch. The contemporary Tank Basculante, above. 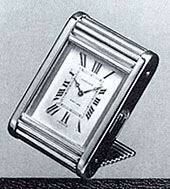 A Cartier travel clock from 1931, left. 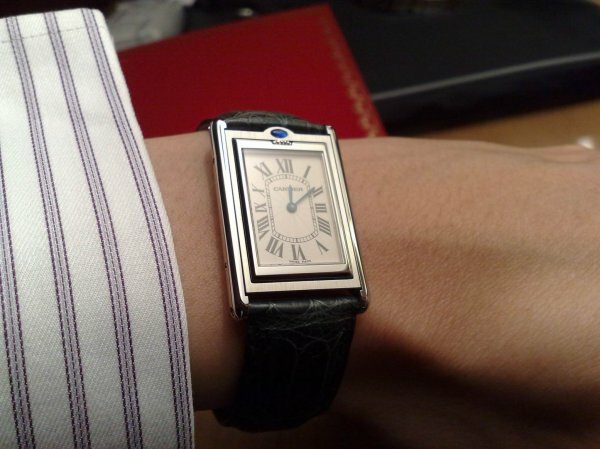 Rooted in a long tradition of folding or reversing wristwatches, miniature travel clocks, and ermeto (or "purse watches"), the Tank Basculante is a contemporary offering from Cartier. Meaning, in English, tilting or tipping tank, the Tank Basculante is offered in stainless steel at a US retail price just under $5,000. 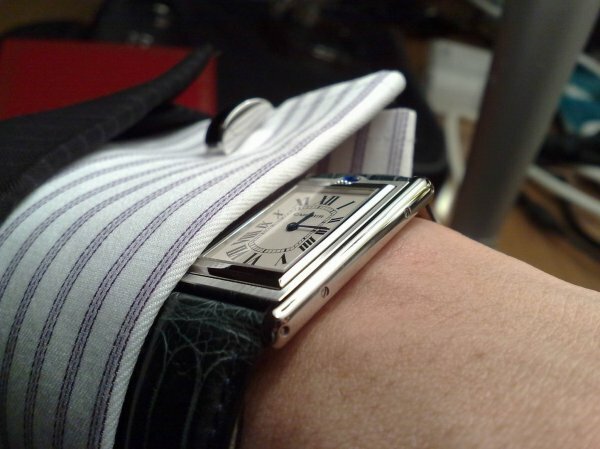 It can, like the famous Jaeger LeCoultre Reverso, be reversed on the wrist. 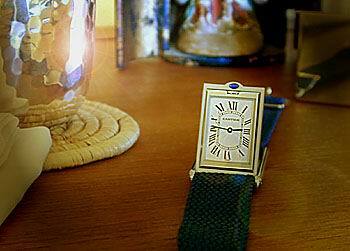 But unlike the Reverso, it can also be used as a miniature travel clock on a bedside table. In keeping with company tradition, the Tank Basculante is first and foremost a piece of design. (Surprisingly, it is also a solid piece of watchmaking, about which more later.) 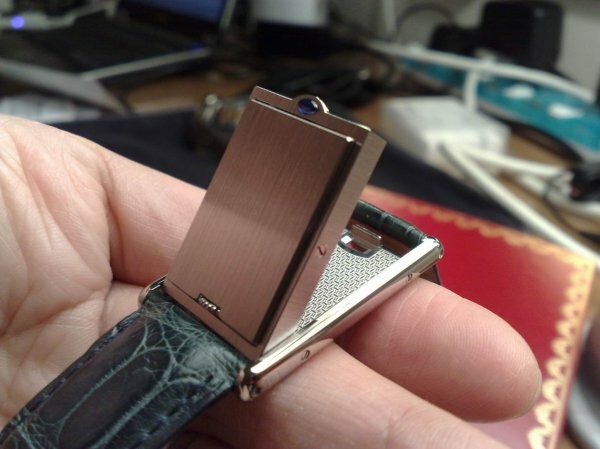 The watch case, proper, is mounted in a frame that is hinged at the lower end to the third piece of the case, the back. 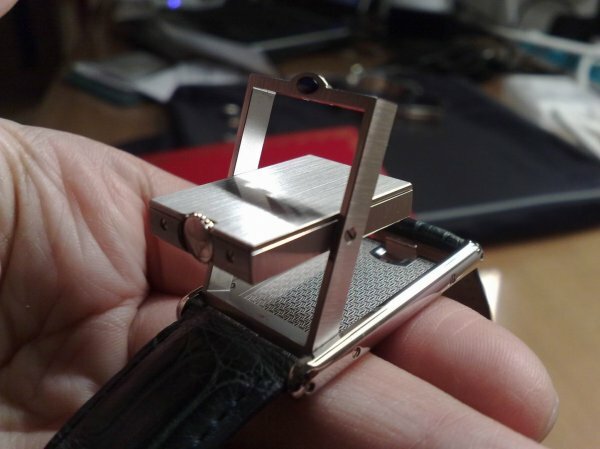 Within its frame, the watch case can pivot for reversing or angling. The case is very sturdily constructed and extremely well finished. 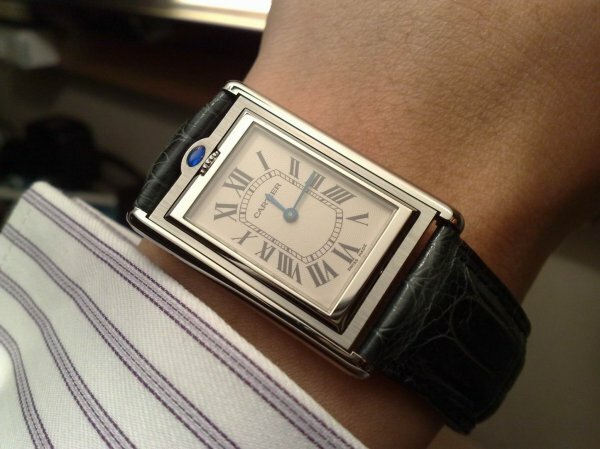 Though perhaps a tiny cut below the superb finish quality of a Reverso, there is little to complain about in the execution. 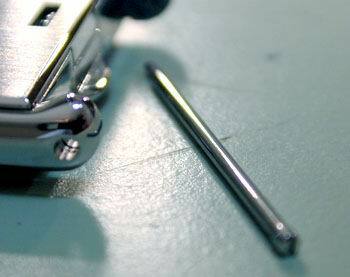 The complete case assembly measures 38 by 25.5 millimeters, but is just six millimeters thick. 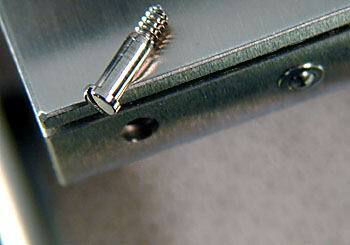 Four massive five-millimeter screws (left) hold the case bezel to the back. 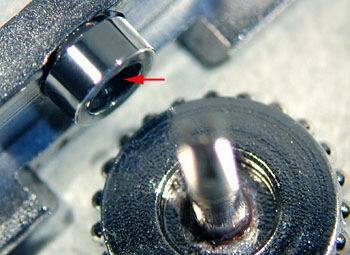 Note, also, the sprung ball bearing that locks the case to its frame. Another four screws hold the back section of the case together, and an additional two provide the pivoting of the case in its frame. 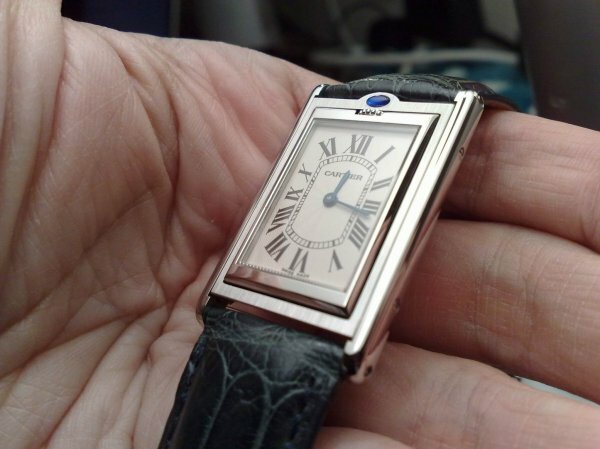 The dial is a classic Cartier dial with guilloche, distorted Romans, a minute track, and blued-steel spade hands. 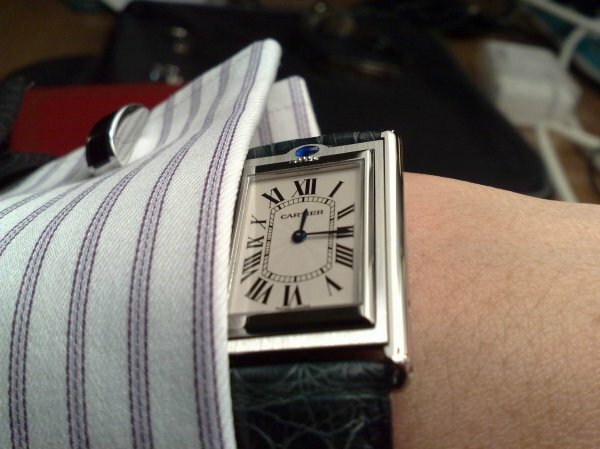 It is unmistakably Cartier, and very French. 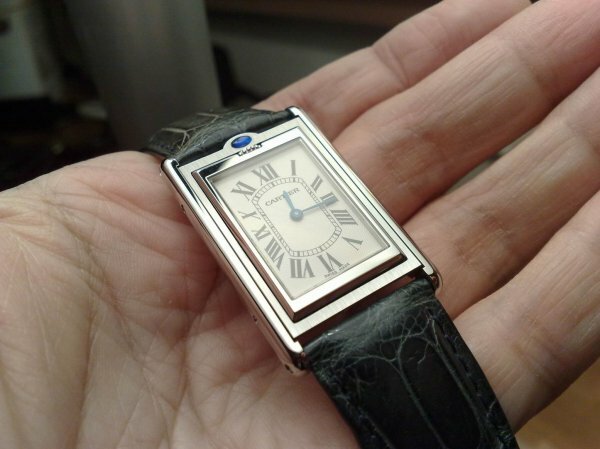 Like most Cartier wristwatches, the Tank Basculante contains a "secret signature" on the dial. extraordinarily massive, no doubt because of the unusual position of the crown and the possibility of abuse by those unfamiliar. 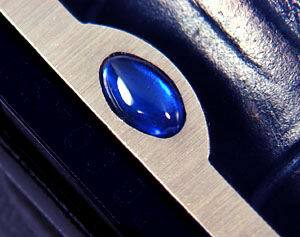 The blue cabochon (Cartier does not call it a sapphire) adorns the tab used to lift the case frame from the back. Perhaps it is French crystal. 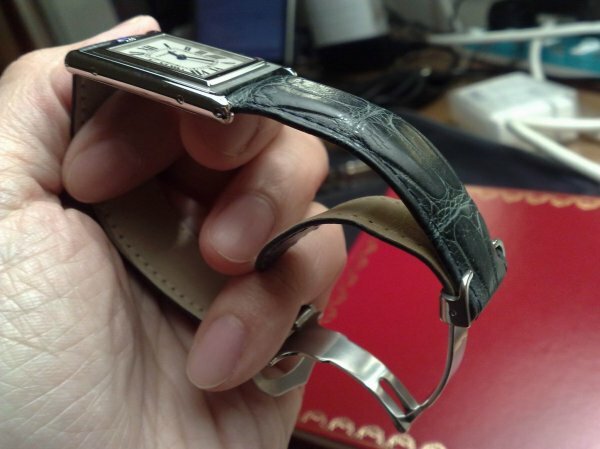 Perhaps unexpectedly, the Tank Basculante is not simply a "jewelry watch." It contains a first-grade movement. 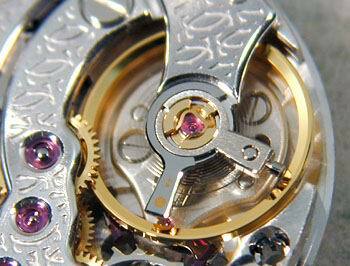 Illustrated left, the movement is nothing less than a Frederic Piguet caliber 6.10. 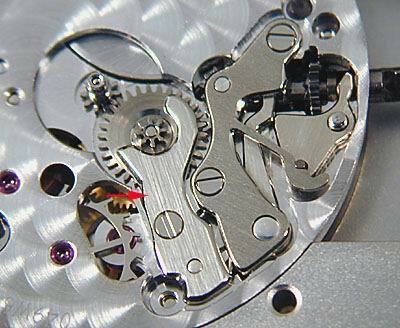 A diminutive 6.5 lignes (15.2 millimeters) and 2.1 millimeters thick, the movement runs at 21,600 beats per hour in 21 jewels. While not the form movement we might have hoped for in a rectangular watch, the Piguet is nevertheless a first-class job, through and through. 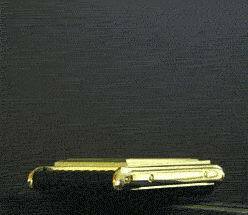 It is, for example, a much finer, much more sophisticated piece of work than Jaeger LeCoultre's basic Reverso movement, the caliber 846. 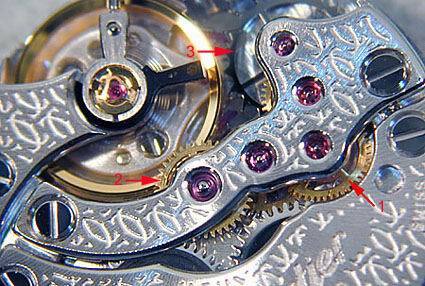 Close inspection of the keyless works reveals the fine craftsmanship of the Piguet. Note the unusual separate (and beautifully executed) minute wheel cover (arrow). 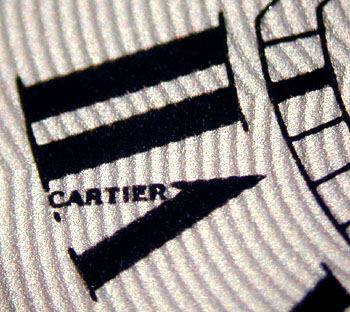 Instead of Geneva stripes, the top plate is decorated with repetitions of the Cartier logo. 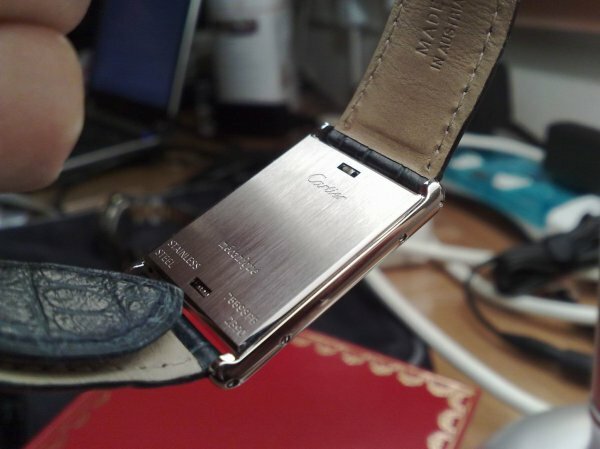 This is embossed (rather than engraved), and is the single cost-saving effort apparent in the movement. 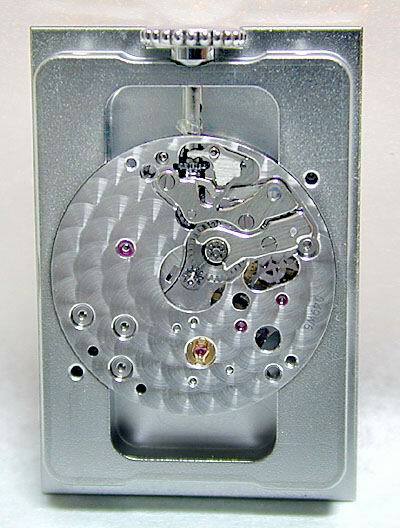 Cartier calls the 6.10 a Cartier caliber 060, and the Piguet name and caliber markings are no where evident on the movement. With its fanciful scalloping, the wheel train bridge might have come from no one but Piguet. The wheel train contains an extra wheel ( arrow) between the third and fourth wheel which rotates once each two minutes. 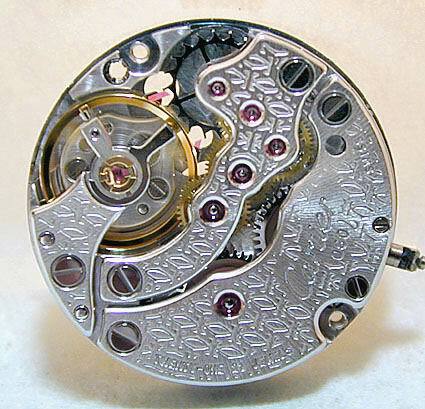 I believe that this may have been done to properly position the fourth wheel at six o'clock (to allow for subsidiary seconds) without compromising the size of the balance or mainspring barrel. The three-spoked Glucydur balance wheel is protected by KIF shock absorbers. The flat balance spring utilizes a simple regulator of notable quality. The Tank Basculante offers a piece of tradition, considerable charm, and surprising quality throughout. 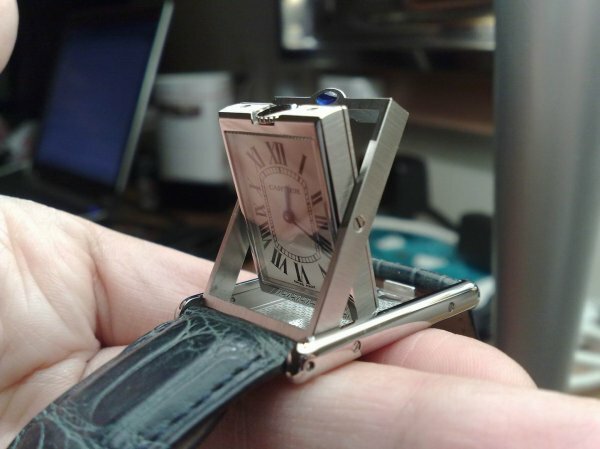 The design integrity of this watch is woefully lacking in the majority of contemporary Swiss watches. The Tank Basculante is also useful and comfortable on the wrist. 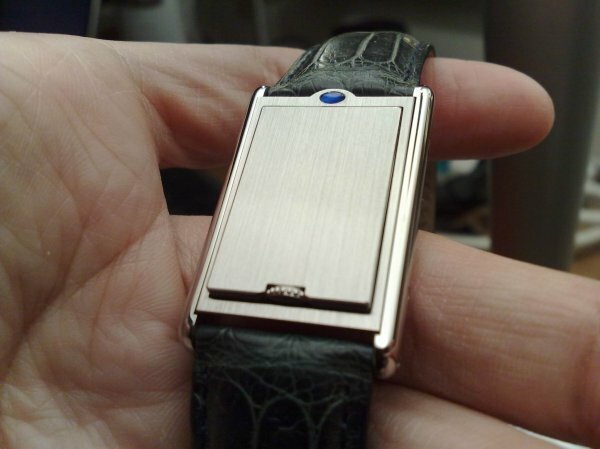 If there is a caveat about this watch, it lies in the marketing behind the watch. 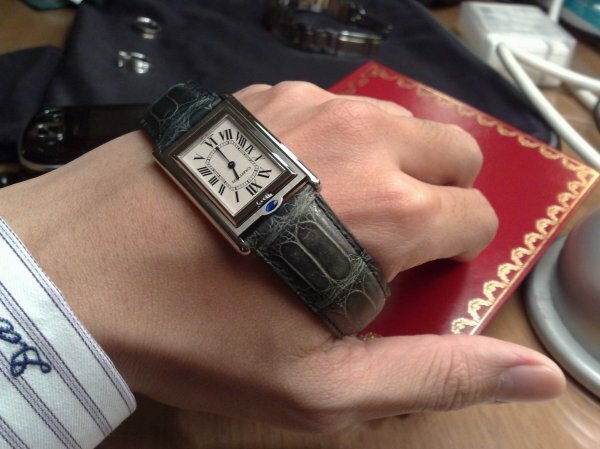 The red leather owner's booklet suggests no less that four times that the watch be serviced by Cartier. 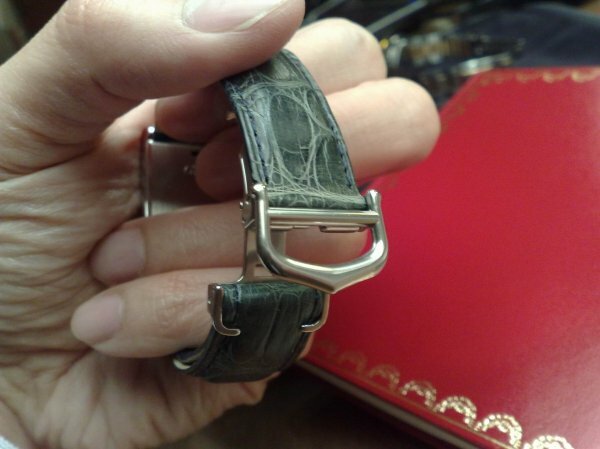 Indeed, on changing the leather strap, the owner is advised to allow a Cartier agent to do it, "in order to maintain the validity of the Cartier International Guarantee." As if to make their point, the bottom strap screw (but not the top) was impossible to remove without destroying it. I believe that this was deliberate (done with high-strength Locktite), and it required making a new screw on the lathe. 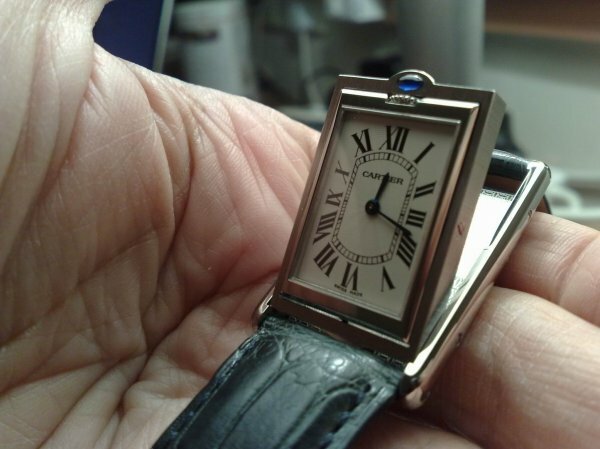 Like Vacheron Constantin and Jaeger LeCoultre in the US, Cartier has been in the vanguard of attempting to monopolize service on its watches by selling no parts to independent watchmakers--not even strap screws or other, simple external parts. 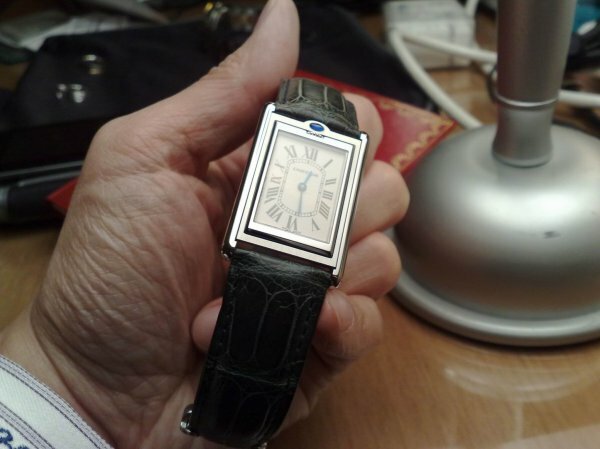 If you like the Tank Basculante, be prepared to meet your local Cartier service agent sometime in the next few years. Or, better yet, treat yourself to a Tank Basculante and watchmaker's lathe at the same time.